The most common variety of banana used in baking, fruit salads, fruit compotes, and to complement foods. The outer skin is green when sold in food markets and turns yellow when it ripens. When overripe, the skin will turn black and the flesh becomes mushy. 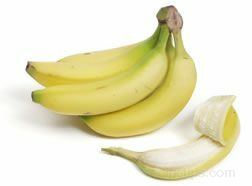 Bananas ripen naturally without being refrigerated, however by placing them in a refrigerator, the skin darkens quicker but they are kept from becoming soft and mushy for a longer period of time.